Replace solvent degreasing systems with a complete line of aqueous cleaning systems featuring the Sterling barrel. Standard System features a choice of cleaning barrels in available off-the-shelf configurations. 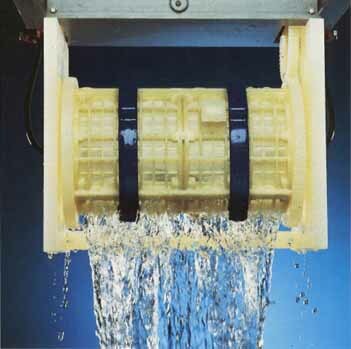 Rinsing is accomplished in a combination of unloading and rinsing station designed for ease of parts handling. A complete system features degreasing, rinsing and drying operations with ease of handling. Degreasing tank features in-tank filtration, oil separation, temperature control and both solution and parts agitation. 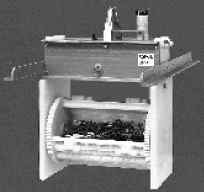 A Sterling Bulk Parts cleaning system is versatile, low cost, and compact. Call our 1-800 number for prices on a complete system. Sterling Barrels feature heavy duty polypropylene square hole construction for heavy parts or mesh construction for smaller parts. 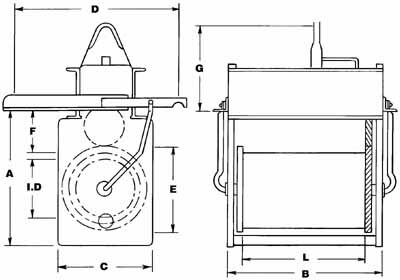 Centrifugal Dryers offer efficient hot air drying of small parts. Spin the basket of parts while hot air evaporates the final traces of moisture. When ordering, Specify: Model number, motor RPM, cylinder style. Rugged flat panel square construction is recommended. Available in .093 or .220 opening standard. All dimensions are in inches.